From a dull ache to centralised pain, discomfort in the lower back area can be debilitating if left untreated. Whilst painkillers may ease the symptoms, they do not treat the cause which can lead to you relying on regular medication in order to get through daily life. 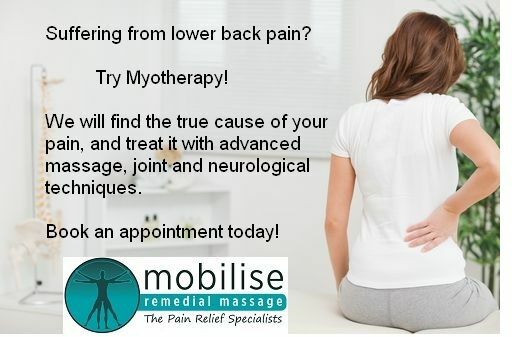 Here at Mobilise Remedial Massage, we believe that getting to the route of back pain through remedial massage techniques is by far the best method of both alleviating painful symptoms and understanding the cause for long term relief. Myotherapy has long been hailed as a highly effective technique for the treatment of lower back pain. This complex therapy is not only beneficial for those suffering from pain, but is also a fantastic way of reducing stress and tension as well as on-going injury management. Lower back pain can occur for all manner of reasons but one of the most common causes is the injuries sustained whilst playing sports. It is because of this that we also offer state-of-the-art sports massages carried out by our highly professional team. Sports massages are highly beneficial as they can be tailored in accordance with your area of discomfort and long term goals for recovery. A member of our team will assess your needs thoroughly in order to devise a suitable treatment programme. There are also occasions where lower back pain is caused by a musculoskeletal disorder. If this is the case, contacting our team for Myotherapy could truly enhance mobility, pain management and general well-being. We use a broad range of specialist techniques that draw upon many elements of physical medicine such as exercise rehabilitation, hydrotherapy, and PNF stretching to name just a few. Whether you are looking for therapy that supplements existing treatment or if this is your first time seeking massage therapy to treat back pain, you can rest assured that our experienced, qualified and approachable team will do all they can to ease the ache and establish the cause of the problem. To find out more about the treatment of lower back pain Brisbane, search our website today for further information.